It's been almost two months since we lost our third child, Gabriel, to miscarriage. Not a day goes by that we don't miss him, talk about him, and pray for him. I've been avoiding his grave. I feel like a terrible mother for saying that, but I have. We chose to have him buried in an individual plot with a marker, because I knew that, long term, I would want to be able to visit him. In the beginning, though, having a marked, real grave for him - a grave stone bearing the sweet little name we gave him - has made the grief much more raw. Every time I visit his grave, I cry. Most of the time, I almost feel like my pregnancy with Gabriel was a strange dream. Much of the time, I try not to think too much about the loss of this child, because I have two other children to raise and a marriage to nurture, and I can't afford to let the grief crush me. But every now and then, something will trigger my grief. The other night, I opened our medicine cabinet and saw the small bottle that contained my hyperemesis gravidarum medicine (to combat the crippling nausea I experience in pregnancy). That little bottle wasn't there, prior to March. I felt the grief come rushing back. 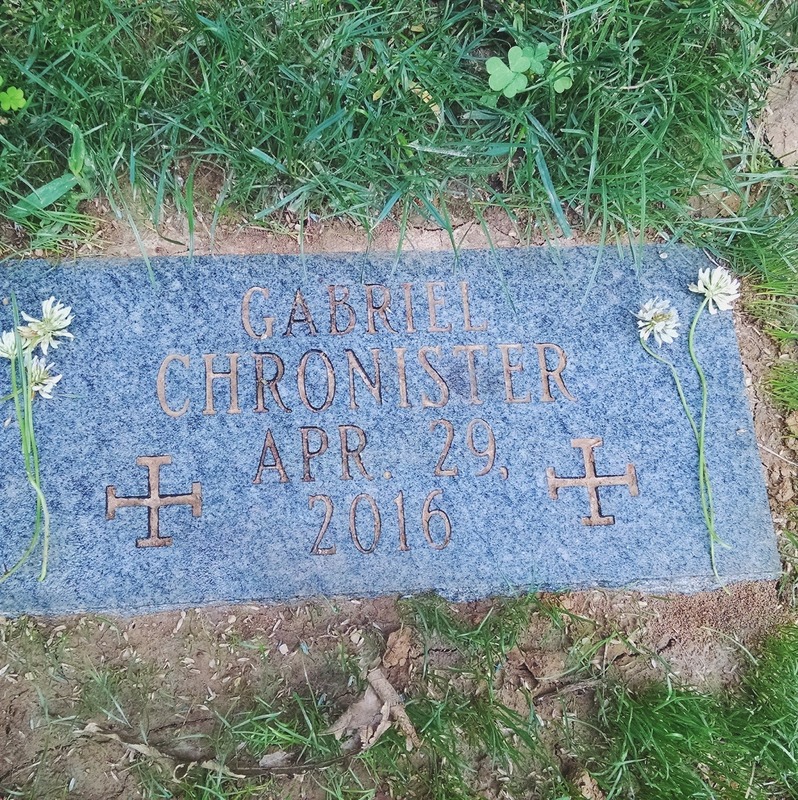 I was running errands recently, and realized that I had been meaning to get a new pinwheel for Gabriel's grave. 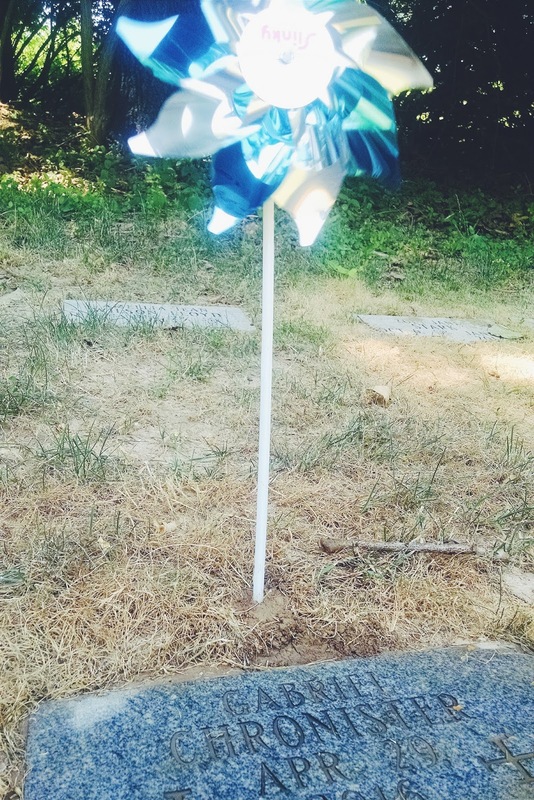 (I didn't fully understand the value of those pinwheels and toys in the baby section of the cemetery until losing our little one and realizing what a comfort and joy a simple little pinwheel can be to older siblings.) I didn't particularly feel like visiting the cemetery, and experiencing the rawness of that grief all over again. But, darn it, I knew I needed to check that stupid pinwheel off of my list. It was my first time visiting his grave by myself. The other times I had been with friends or family. I got there, and the first thing I did was laugh when I saw how dirty and dusty his little marker was. I knelt down to brush off the dirt, and laughingly said, "Oh my goodness! Your little marker is always so dirty. I wonder if you would have been a messy little boy..." As I said these words, the tears filled my eyes. I hate the "what ifs." The lack of rain recently meant that the soil was hard and dried out. I couldn't get that pinwheel stuck in the ground. So much for a short visit! I ran back down the hill to my car, and got my travel mug, which was filled with juice and water. It's a staple drink of mine, and of my girls. I poured it on the dirt to soften it, and as little rivulets ran down the grave marker, I used the wetness to clean off his dirty little stone. "Oh my sweet Gabriel," I said, "I wish I could just be pouring you a sippy cup of apple juice and water." Again with the "what ifs." I felt a fresh wave of tears come. "I love you, my sweet littlest Love," I told him. "I will always love you, my sweetheart. Until my last breath and even after." I cried and prayed and talked to Gabriel, and worked on the dirt until I was able to get the pinwheel wedged in. I sat back on my heels, and turned to look down the hill, and that's when I saw it. It was a radio tower. I don't know how I had never noticed it before, but the view from Gabriel's grave was mostly taken up with this radio tower. That might seem insignificant to most, but God and I have a long history of radio towers in our relationship. I've always loved them. When I was little, I used to live on the top floor of an apartment building. In the distance, we could see a line of radio towers from our front window, their red lights blinking steadily. I always remembered those radio towers, and associated them with the feeling of safety and security. They were somehow a connection to the girl who I was, and I link to the woman I was becoming. When I was in college, newly engaged to my (now) husband, I went on a silent retreat. Because I struggle with anxiety and depression, I was really nervous about subjecting myself to days of silence, sans any distraction. The retreat also came at a time where I was dealing with some stressors in some of my close relationships (not my relationship with my husband), and I was in an extremely vulnerable place. If you are familiar with the campus of Notre Dame, you know that there are two lakes on campus. Across St. Joseph lake, the Congregation of Holy Cross has their seminary. The retreat was being held in the seminary, overlooking the lake and the campus. 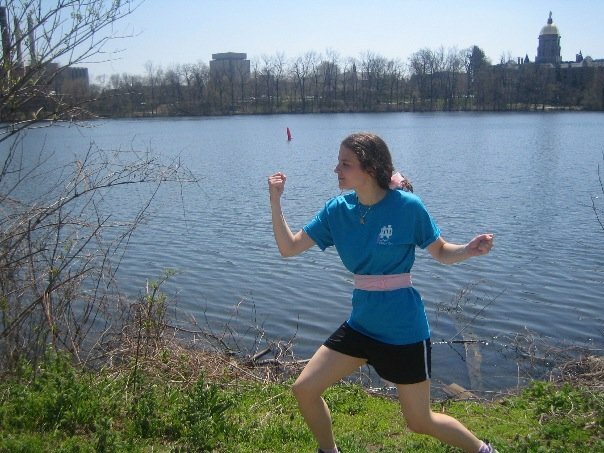 I'm resurrecting an incredibly old, embarrassing picture of myself, participating in my dorm's "chicken run" in order to show you the view I'm talking about. Anyway, the first night of the retreat, I was in my room and looking out the window when I saw it, glittering far in the distance. It was a radio tower. It sounds strange, but I knew that that radio tower, blinking steadily in the distance, was God's way of reminding me that he loved me and that he was near. That ridiculous blinking red light was linking my girlhood to my emerging womanhood. It gave me such peace to know that God loved me enough to give me a window with a view of a radio tower. When my husband was applying to ph.D programs, I was crushed that the one he chose was so far from family, friends, and the world that I had always known. It was in a city that I had never been in before! Thankfully, a couple of our dear college friends were from that city (the city I now am grateful that I don't have to leave!) and they let us stay with them when we visited, prior to moving. I remember laying in their guest room and crying. I didn't want to be moving, didn't want to have to live in a strange place. I felt so sad, and so alone. Then, one night, I looked out the window and saw a radio tower, blinking steadily in the distance. And, in that moment, I knew everything was going to be okay. It was God's signal to me that all would be well. That radio tower, the one I saw that night, is the same one that I can see from Gabriel's grave. 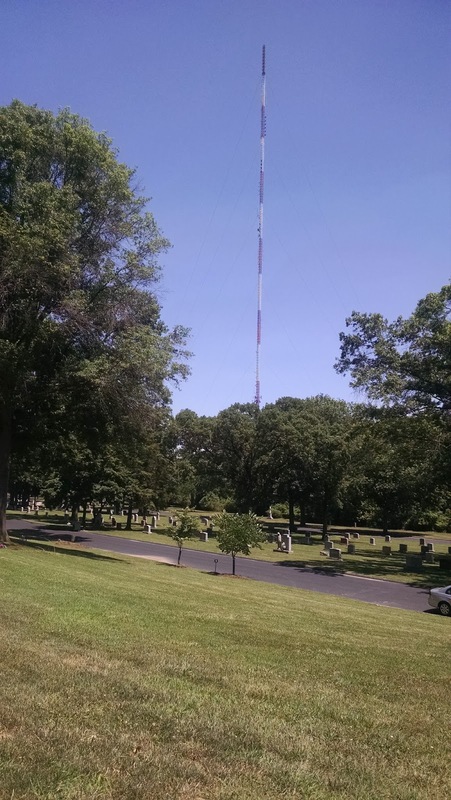 When I turned around and saw that radio tower - literally taking up the entire view from Gabriel's grave - I laughed out loud. There it was - a reminder of God's love. A connection to the girl I was, and the woman I am becoming. The other night, we had one of our seminarian friends over for dinner. One of the things we were talking about was the incredible ordinariness of our vocations, and the fact that holiness happens in those ordinary moments. One of the things I love the most about our faith is the sacramental mindset. God works always, and in everything. The Incarnation - God becoming flesh at Christmas - transforms everything. The Incarnation redeems this world - this sad, tired world. Each thing we touch can be transformed. God can work through the most mundane of things, turning them into conduits of grace. The most ordinary things can be reminders of his love. He can even use radio towers. I'm crying over here reading your words... Prayers for you, friend. I love it when God uses those little moments to remind us that he's there and watching. Isn't it amazing how something so mundane can be so comforting? I too find radio/cell towers strangely comforting. Since we were students, the number of towers south of the city has easily tripled into a veritable little forest of red blinking lights. Despite the flatness of this place, there are a few places (especially my drive home from the grocery store) where I can catch a glimpse of them. Somehow the light, their promise of community and connectivity, and God's strange ways make them beacons of peace. I'll be sure to remember you and sweet Gabriel in a special way whenever I see them. Hugs and lots of prayers! I hope you feel better soon! Thanks for sharing your story Michele, it really is beautiful the way God shares his presence in our lives with us. Praying for you!